FDA Polypropylene Bags - White Dot - 1 lb. 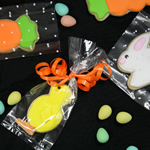 Premium, food approved polypropylene bags for all of your baked and handmade goods. FDA Polypropylene Bags - White Dot - 4 oz. FDA Polypropylene Bags - Clear - 1 lb. FDA Polypropylene Bags - Clear - 8 oz. FDA Polypropylene Bags - Clear - 2 lb.